You can see the live list here: Pluralsight Top 100 Leaderboard. The most exciting part of this is how many people are getting benefits from my course. For those of you who've seen me speak in person, you know that I really love to share information with other developers. What really drives me forward is when I get an email from a dev who tells me that he/she was able to make use of something learned from one of my presentations. It's also great to get an email from someone on the other side of the world who was able to use one of my articles. I'm focused on helping developers take a step up. So, it's very cool to be able to reach so many developers through a single source. I'm available to help you. If you're looking for training (single day, multi-day, or ongoing) or for someone to speak at an event such as a "Lunch & Learn", user group, or developer conference, contact me through my website. If you haven't taken a look at Pluralsight, spend a little time and look through their catalog. There are hundreds of courses on all different technologies. If you just browse the categories, you'll see a huge variety to choose from. Everyone learns best in different ways. Books are my preferred way of learning. But some people like blog articles, some people like trial-and-error experimentation, some people like videos, some people like live demos, and some people like one-on-one training. If you are a "video" or "live demo" person, Pluralsight is a great resource. They offer a 10 day free trial, and this gives you a chance to check out the quality of the courses for yourself. I'm currently working on my next course about one of my favorite things: the BackgroundWorker Component. It's a great little tool that's easy to work with. And even though some people say that it's no longer necessary, it definitely still has its place. So, stay tuned. There's definitely more to come. Would be VERY NICE if you make courses about clean code. My plan is to have some YouTube videos of the refactoring part of the session posted in the next week or two. Keep an eye out. 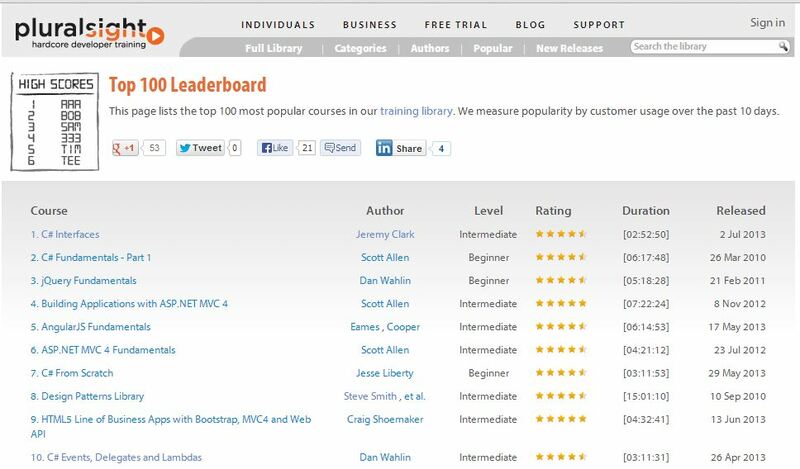 There is a reason your C# Interface course is at the top of the Pluralsight rating. It is excellent! I have been programming in C# for a number of years and this is the best information I have ever found on interfaces. I work alone so I have to depend on books, the internet and online videos for my information and training. Most information on interfaces is either very basic so you don't really get a grasp on how to effectively use them or it is so advanced (Dependency Injection) that you don't have a good enough foundation to understand the material. I am a little over half way done with your online course and I am really understanding many things that I have struggled with for a long time. Thank you, Leo. My goal (whether in videos, on-line courses, live presentations, or articles) is to try to make topics approachable and practical. Thank you for letting me know that I'm hitting that goal. I have presentations on a number of topics including Delegates, Lambda Expressions, Interfaces, Generics, Design Patterns, and Dependency Injection. All of my presentations are available to download as PDFs on my website: http://www.jeremybytes.com/Downloads.aspx. Enjoy the rest of the course! Hi Jeremy, congratulations indeed about your Pluralsight course about interfaces. Just a question: you never speak about database (SQL Server, T-SQL), neither there's books reviews about them. Why? They're out of scope about your interest? Any possibility something appear in the near future? SQL Server is not my area of expertise. I'm competent with database design, queries, indexes, and so forth, but there are people way smarter than me who specialize in data. If you're looking for SQL Server info, check out Lynn Langit (http://lynnlangit.com/). She offers tons of great information and has a large number of video on her YouTube channel. I am working through your course now. This is exactly the kind of course I needed to move out of the beginning level courses. The course is a great addition to pluralsight. I started my first MVC web site for a small work project and used interfaces. A patterns course would be great! I know PS has some already but they move a bit fast for me. Thanks and keep up the good work. Good news: I'm currently working on course called "Design Patterns On-Ramp". The goal is to make developers comfortable with patterns. We use them every day even if we don't realize it. I'll be sure to post when the course is available.